This information is subject to change. Please check with the pool upon arrival for the most up to date information. 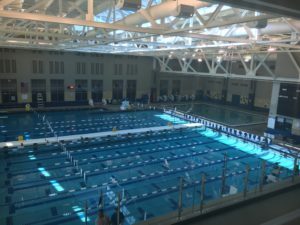 The W-L facility contains a 25 meter x 25 yard competition pool equipped with a movable bulkhead dividing a semi-coupled diving area. The diving area contains two 1 meter springboards. 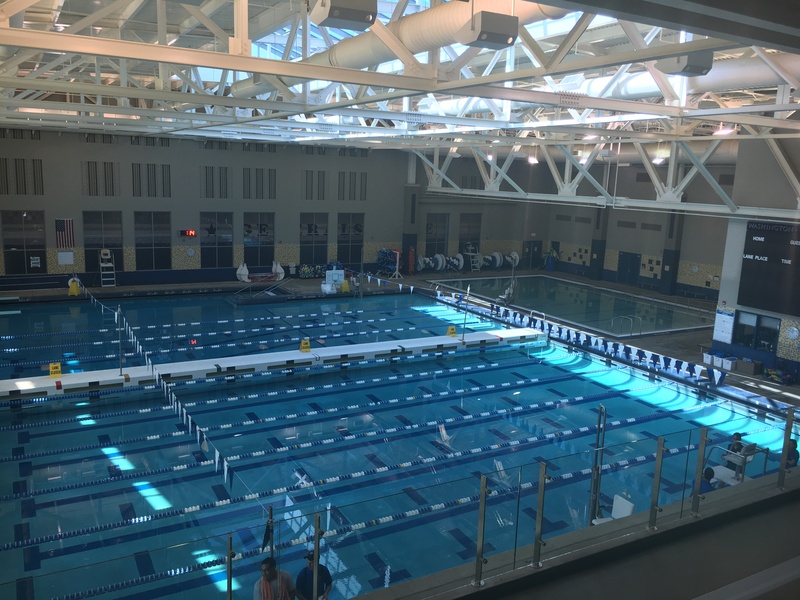 The pool’s movable bulkhead allows us to set up for Water Polo games and to separate the diving well and instructional areas from the lap lanes. Colorado Timing system and scoreboard completes the make up of this facility. The competition pool is kept between 81-83 degrees. There is also a separate instructional pool, kept at 83-85 degrees, a wet classroom, and a spectator area with capacity for 175 spectators overlooking the pools (and the vantage point from which the two photographs were taken). The locker room facilities offer individual shower stalls and there are four family changing areas, two of which are fully equipped and handicap accessible. The pool is located on N. Quincy St. behind the Planetarium and Education Center. The entrance to the Aquatic Center is on the Quincy Street side of W-L High School, next to the Planetarium. Use door Number 7. Parking is available around the pool building and on the I-66 top deck. Please note that on weekdays from 7:30 am-4:30 pm.parking for visitors is restricted to the spaces in front of the pool facing the fields, where several 2-Hour spaces are marked for visitors. Overflow cars may still park on the street (metered) and on the I-66 Parking deck top level.